This is the quilt I made for my husband for Christmas. I did not post it till after becasue I did not want to spoil the surprise. 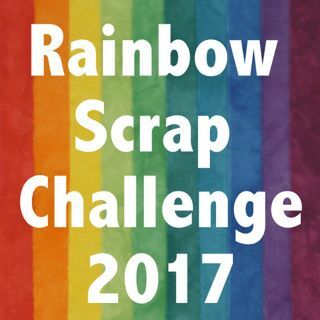 I started the patchwork in June 2009. I worked on it mostly when I was away for the house sewing at sew days. I was to go to a retreat in Nov and finish the top but the retreat fell though. My mom and I still got together and sewed at her house one weekend in Nov. I got the top down in time, then on Dec 21st I quilted it and got started on the binding. Mom helped my finish the binding in time to wrap for Christmas. The surprise was almost spoiled. I took these photos on Dec 21st and that night my husband asked to use the camera. He down loaded the photos and I thought "Oh No, he saw the quilt"
He loves the quilt. He says he did not see it on my camera as there are so many quilt photos he does not know which are mine quilts and which are my customers quilts. 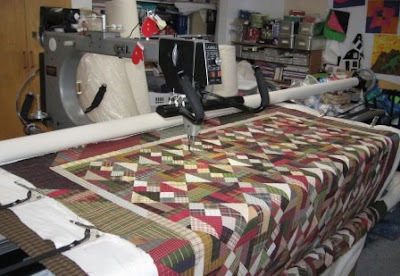 This photo is the quilt on the long arm frame. 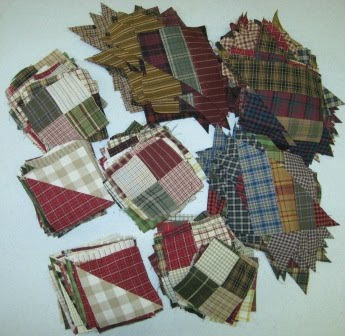 Some of the plaid patches on the go. 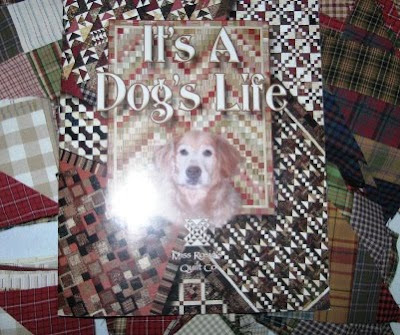 Here is the book I got the pattern from. 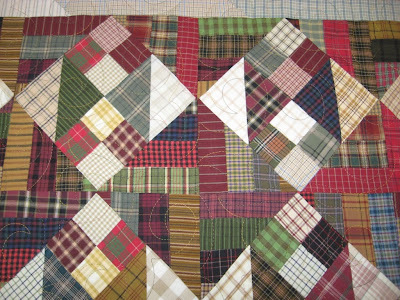 I do not do many quilts from a pattern but this quilt will not be dragged off to quilt shows and truck shows. I just wanted a quick to do quilt.